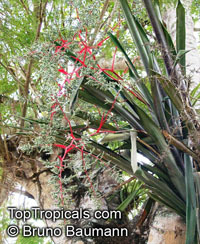 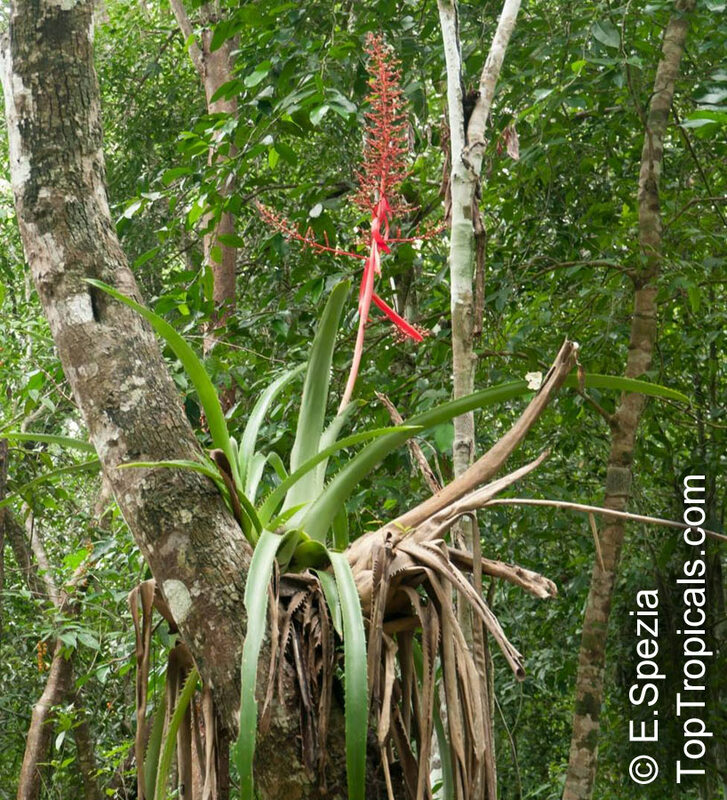 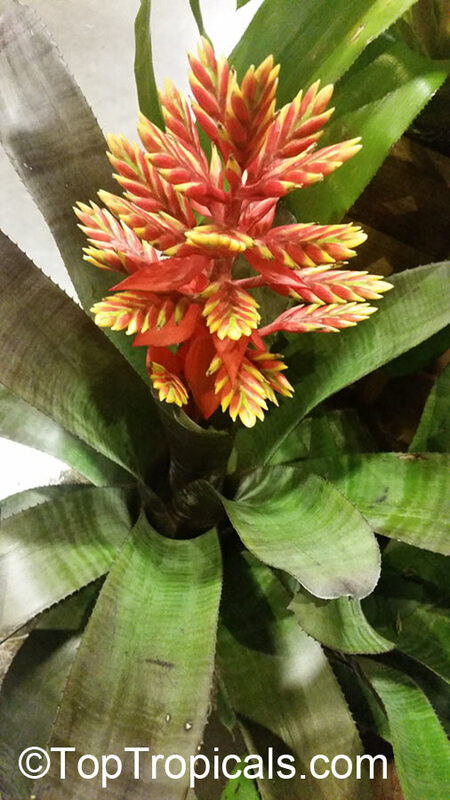 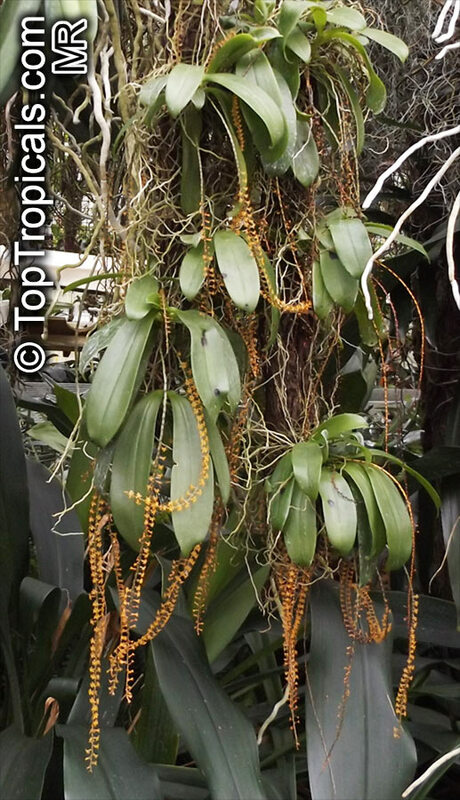 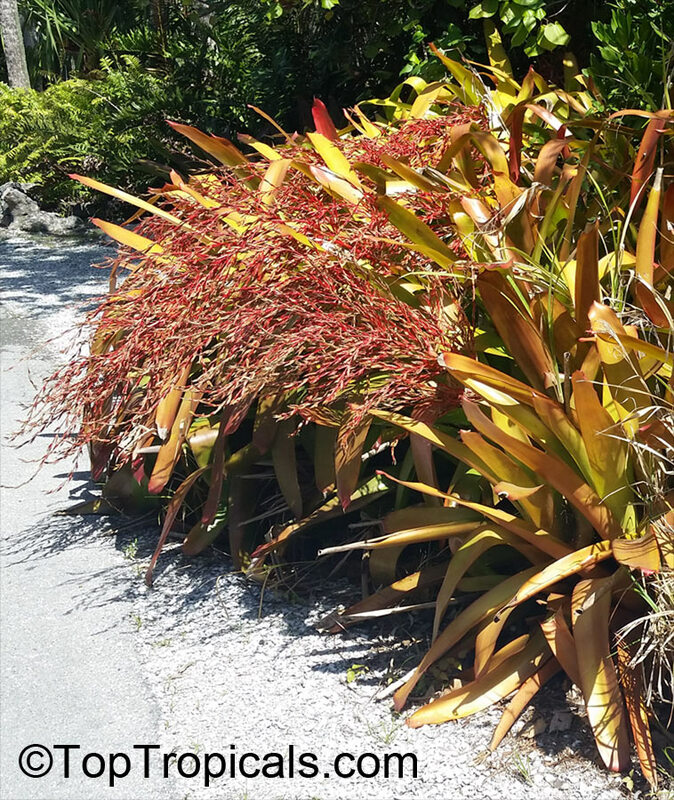 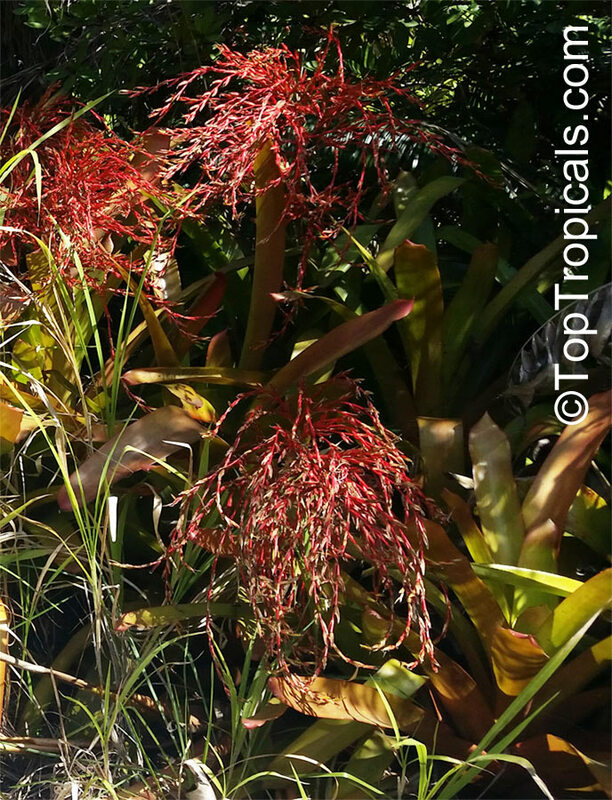 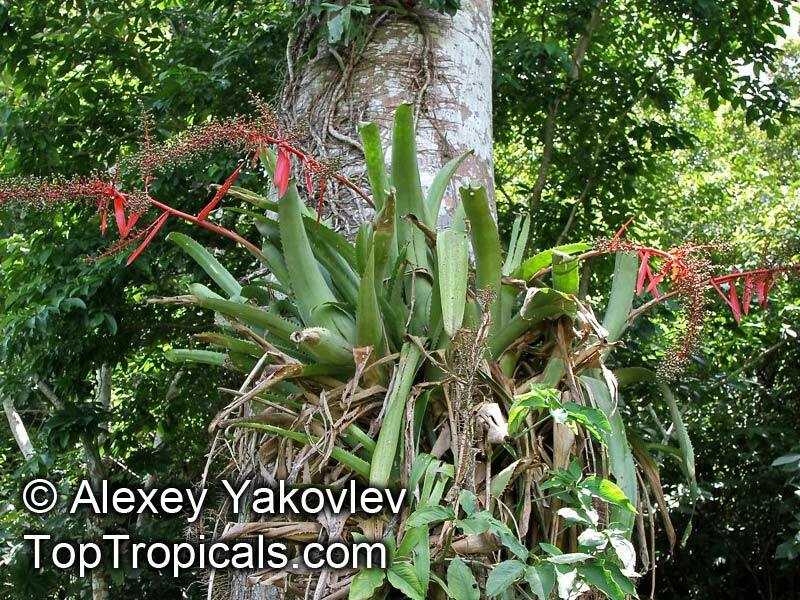 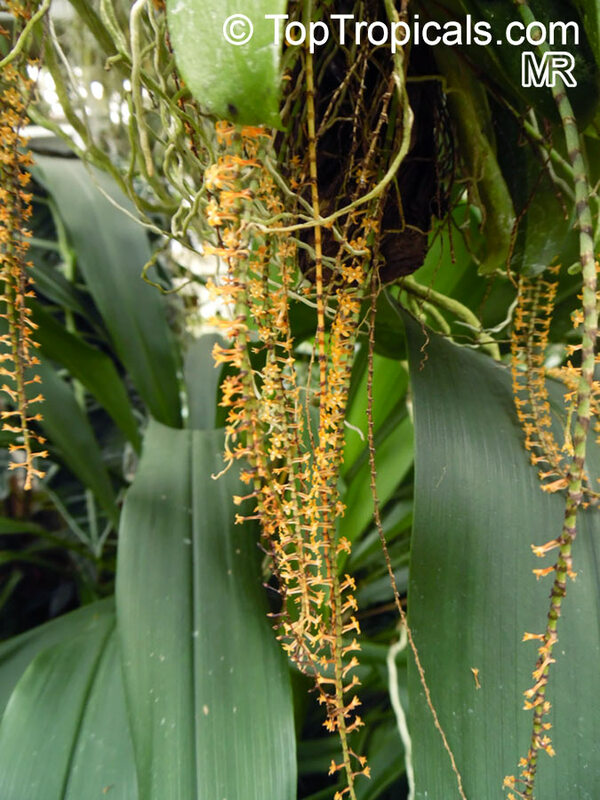 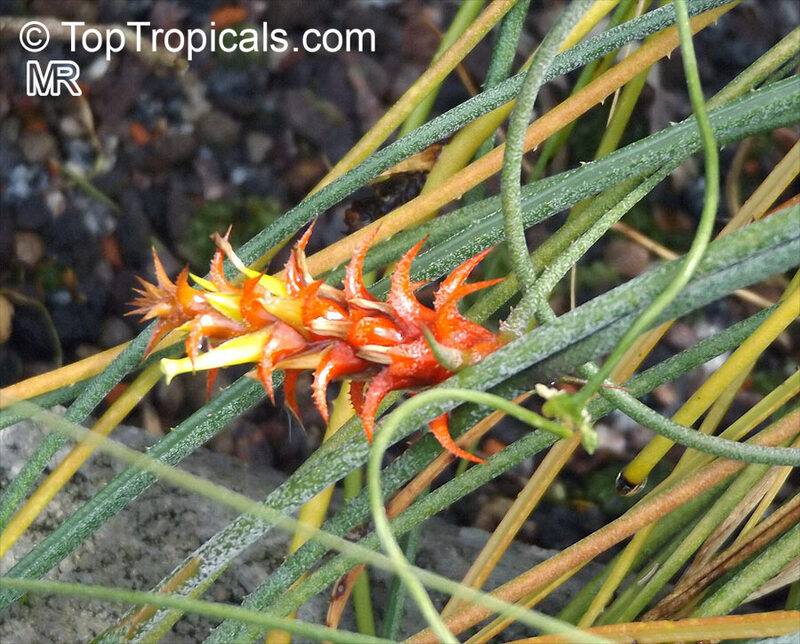 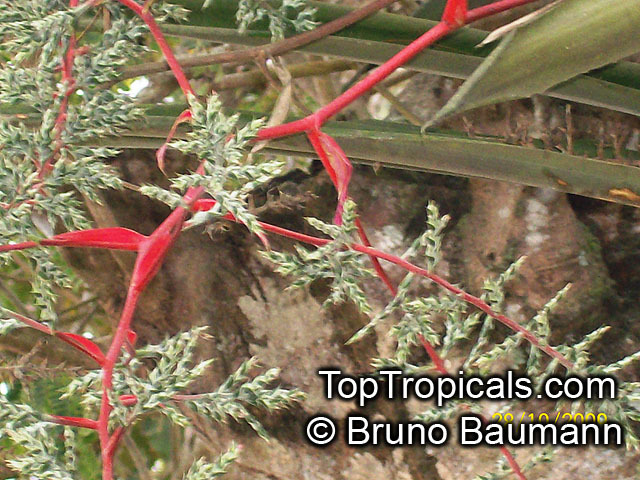 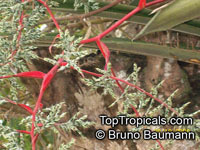 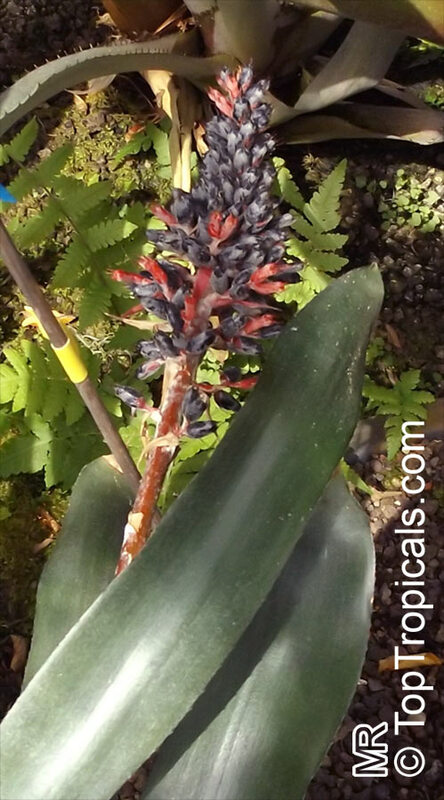 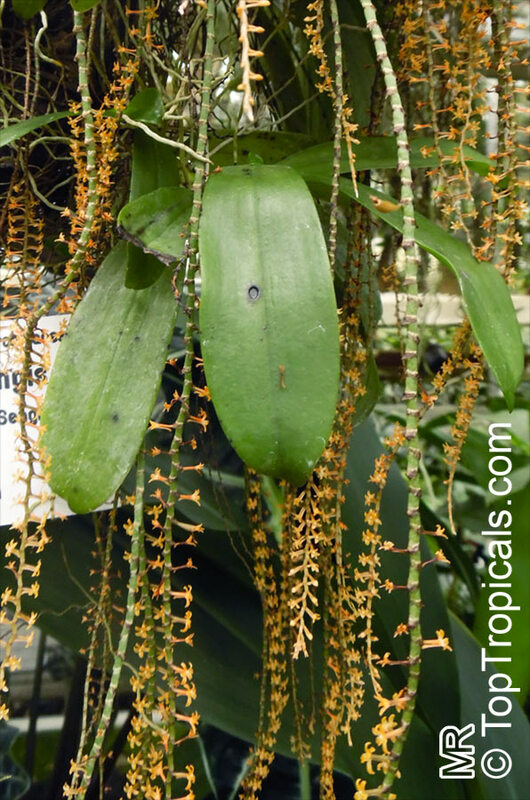 Epiphytic plant with long pendant, very narrow, succulent and channeled leaves deep green with gray scurf and spiny; inflorescence on reed like stems bearing red cone like fruit. 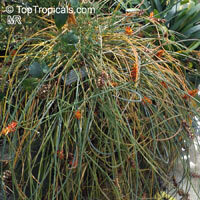 A clumping plant that’s great for a hanging basket. 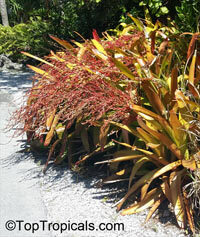 Drought-tolerant; suitable for xeriscaping. 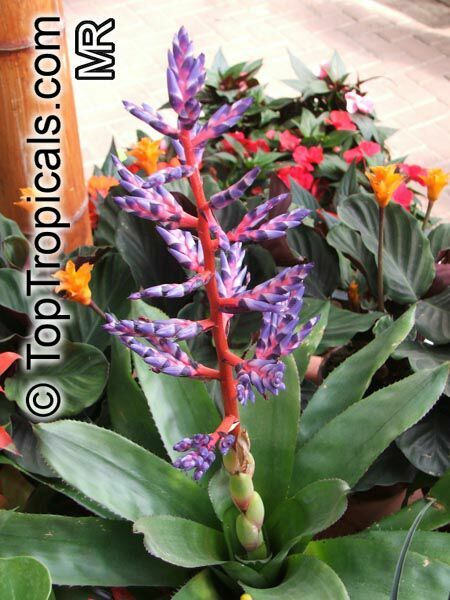 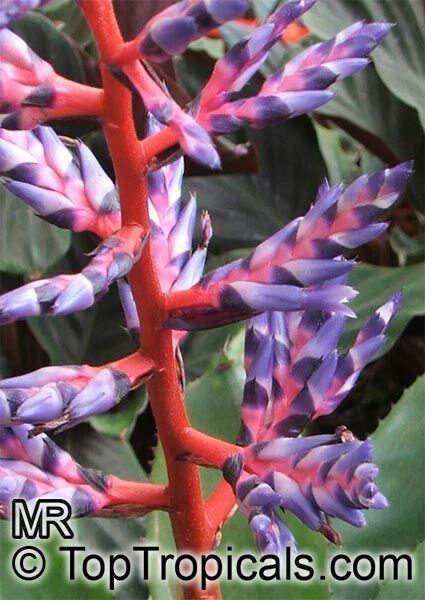 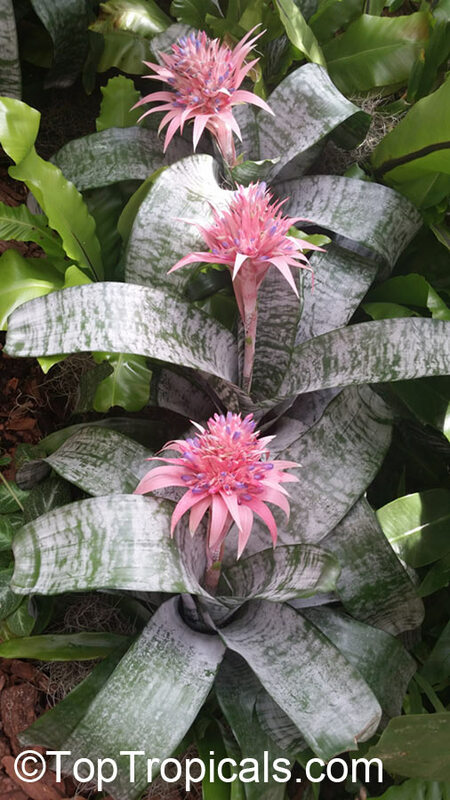 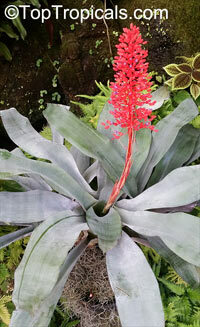 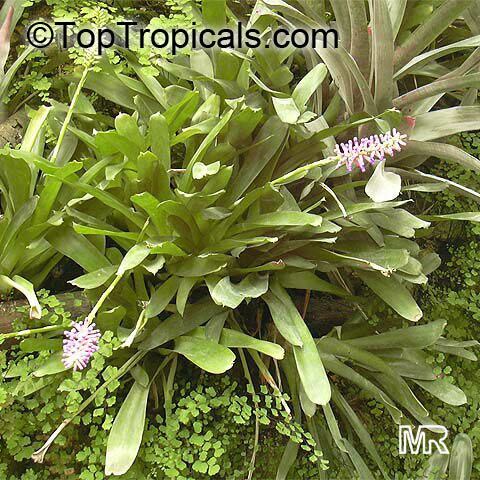 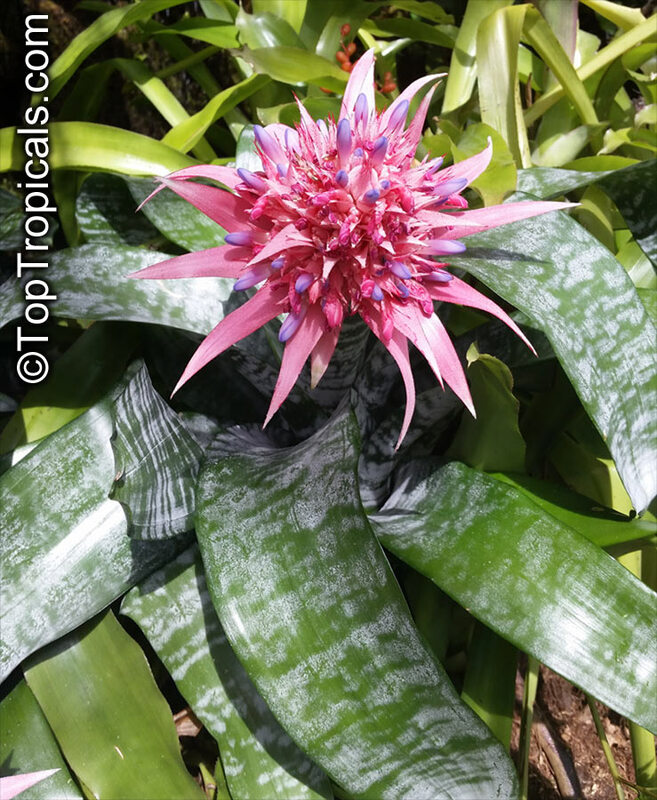 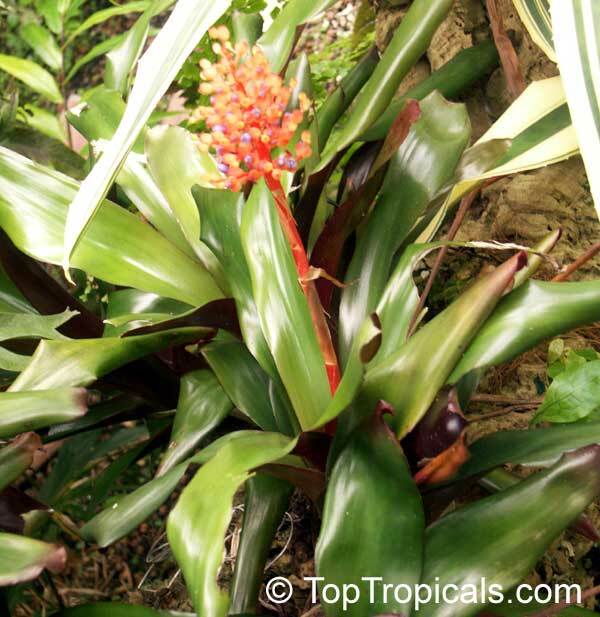 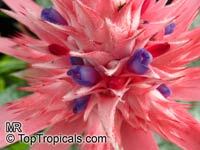 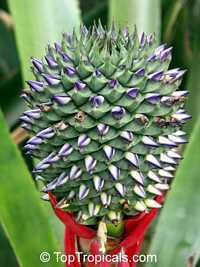 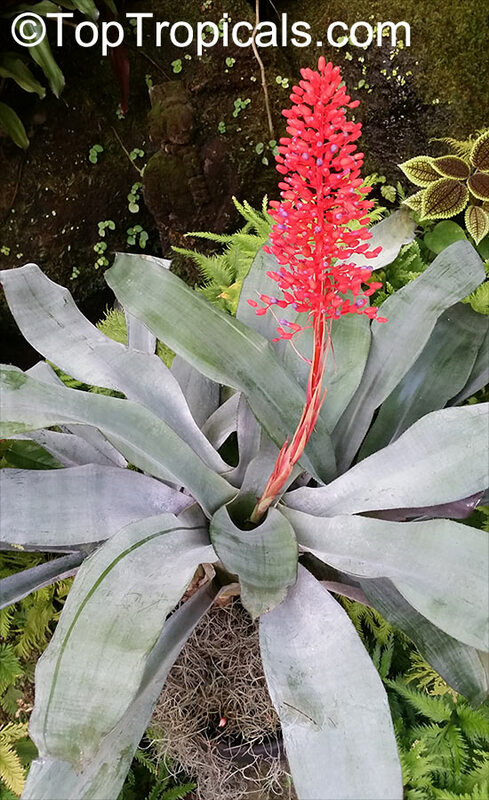 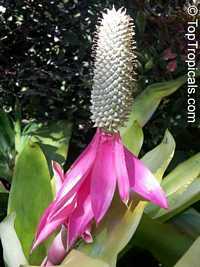 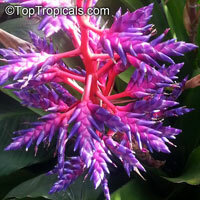 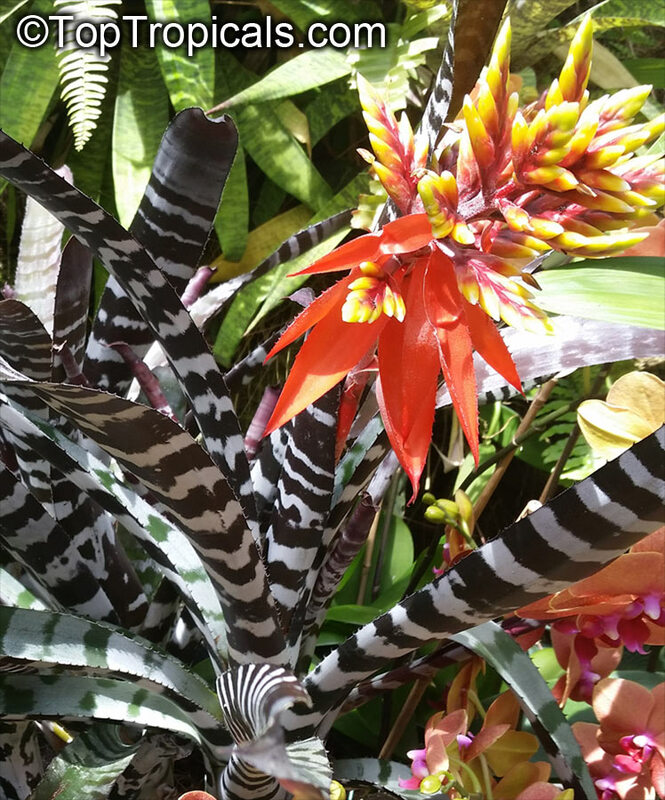 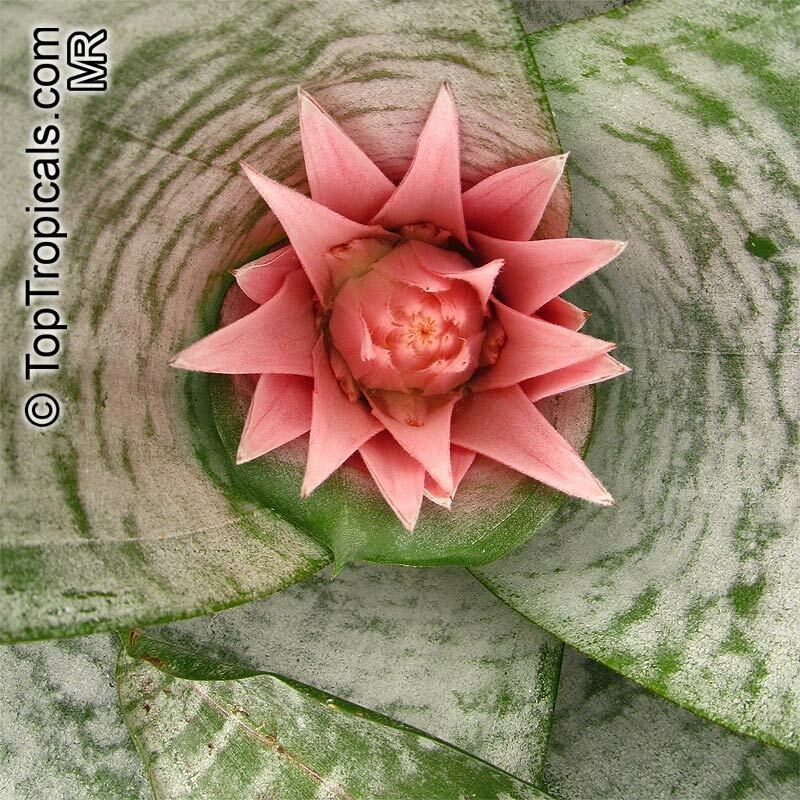 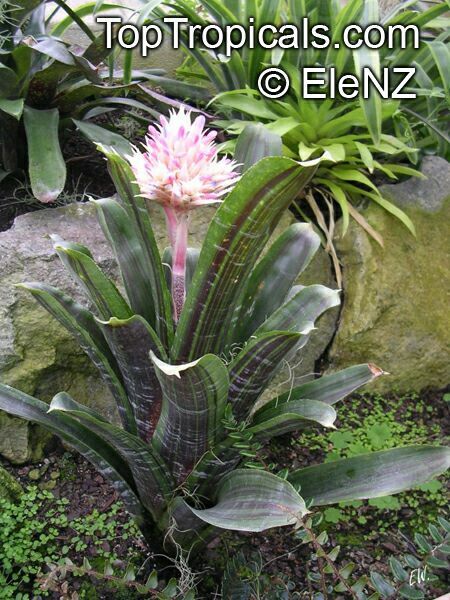 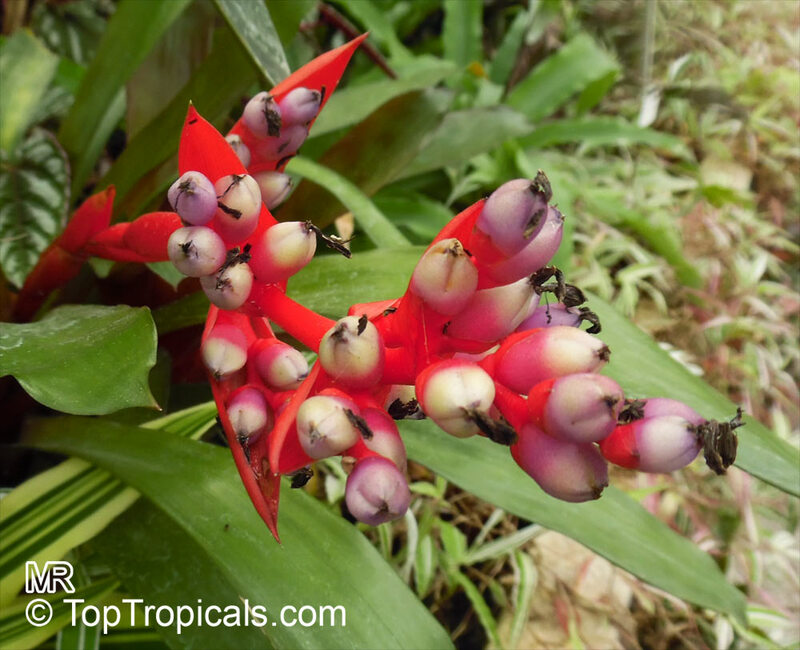 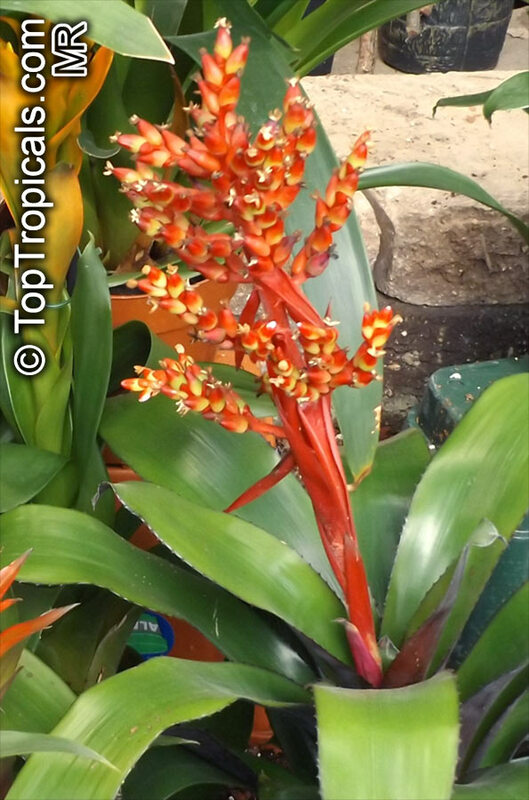 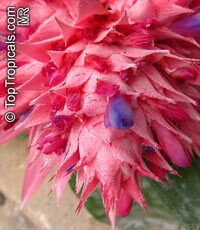 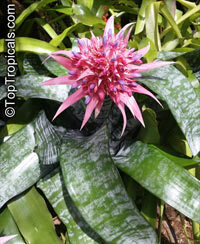 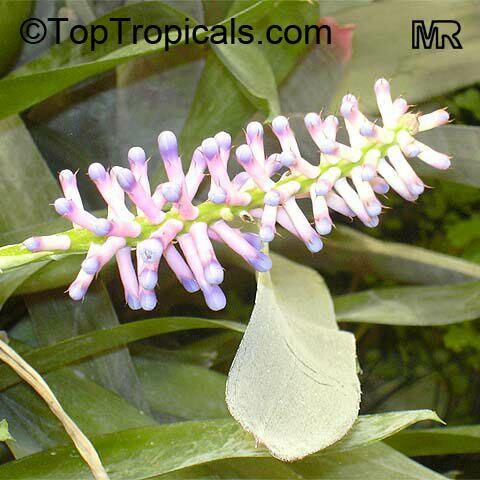 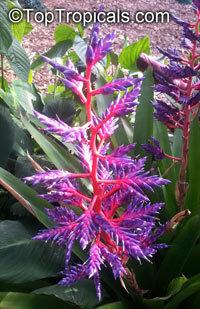 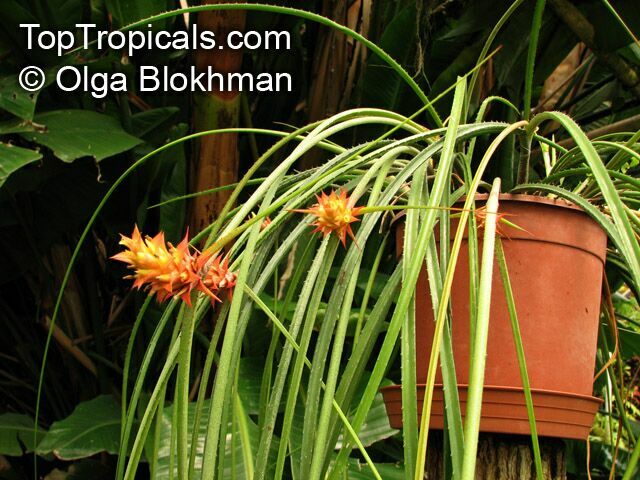 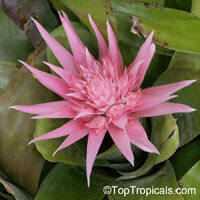 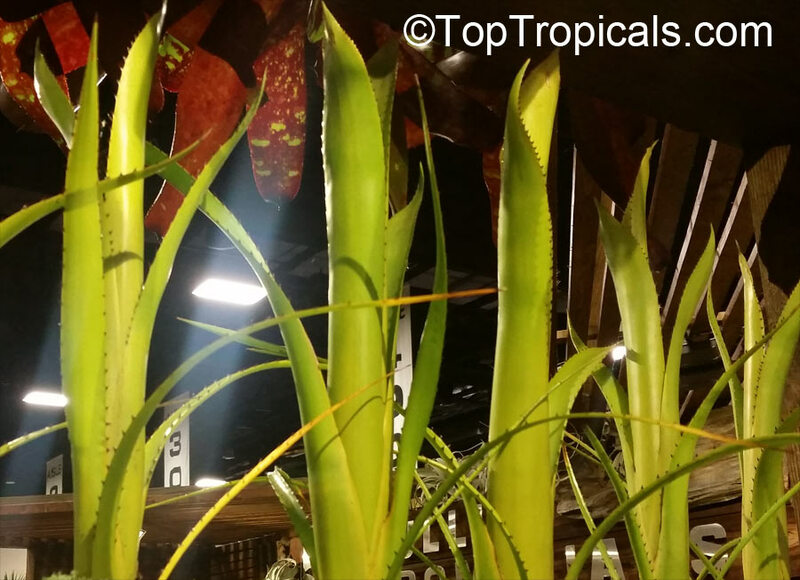 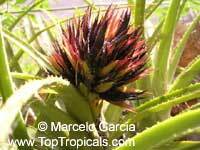 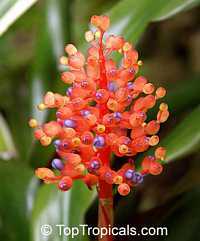 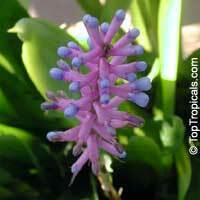 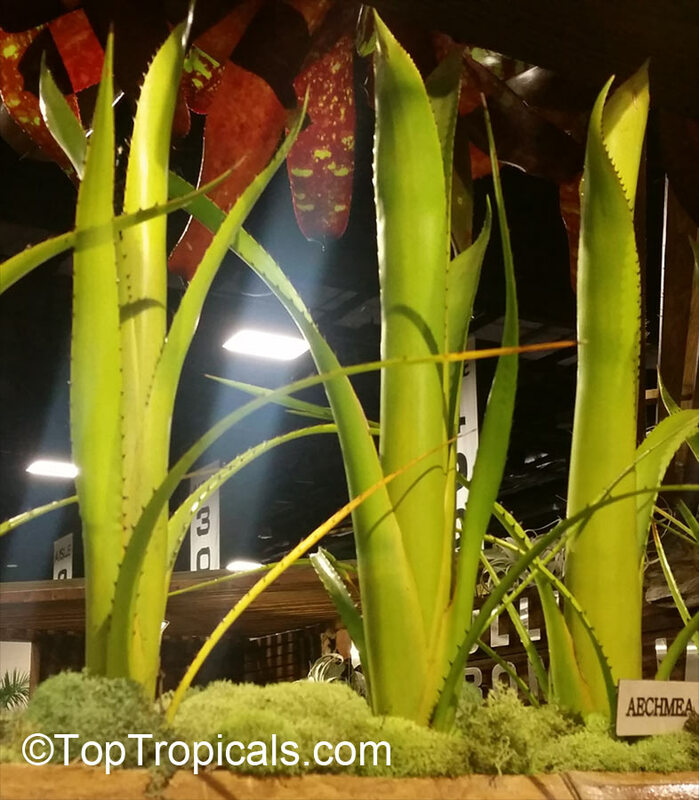 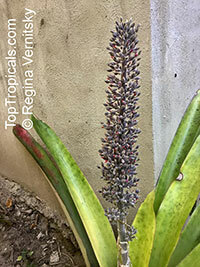 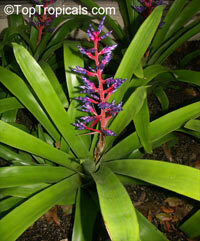 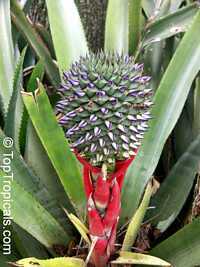 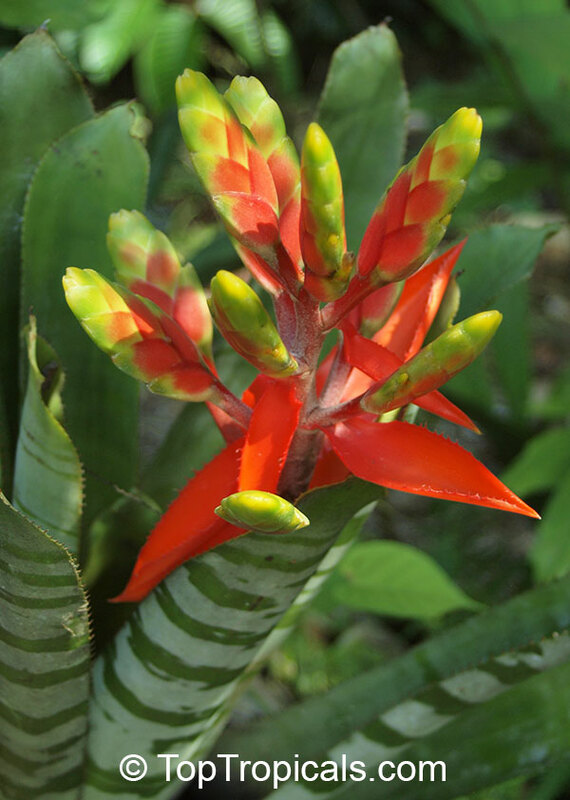 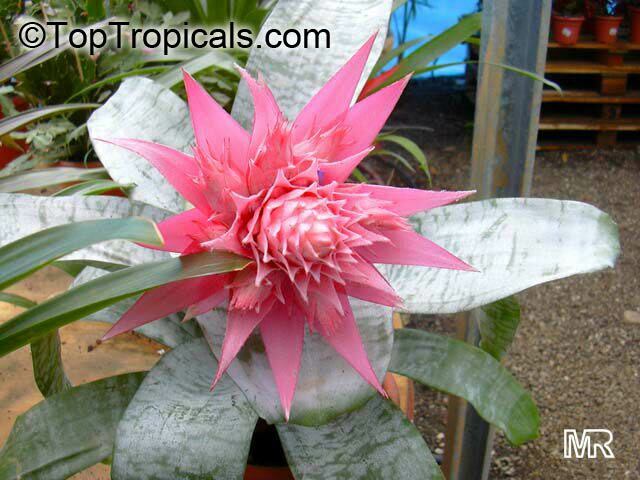 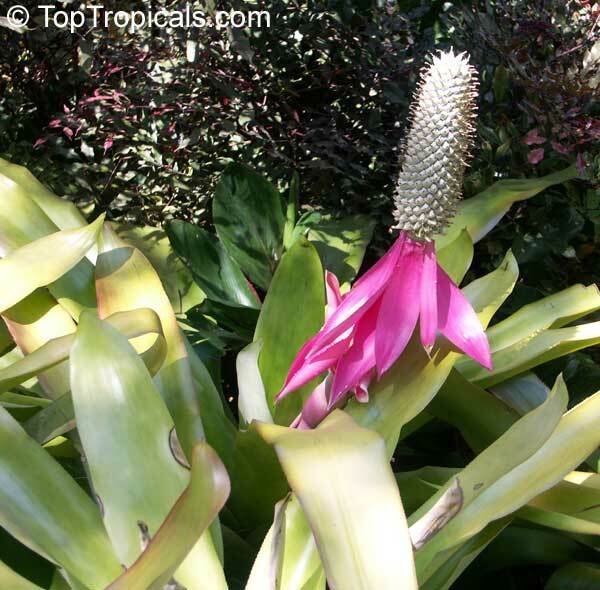 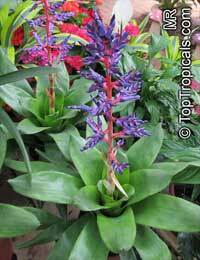 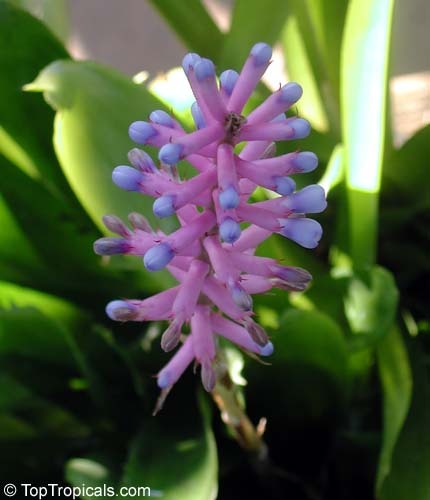 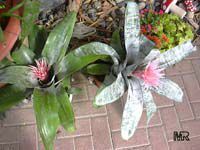 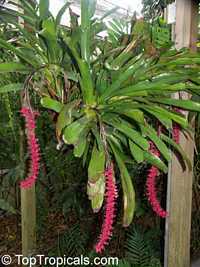 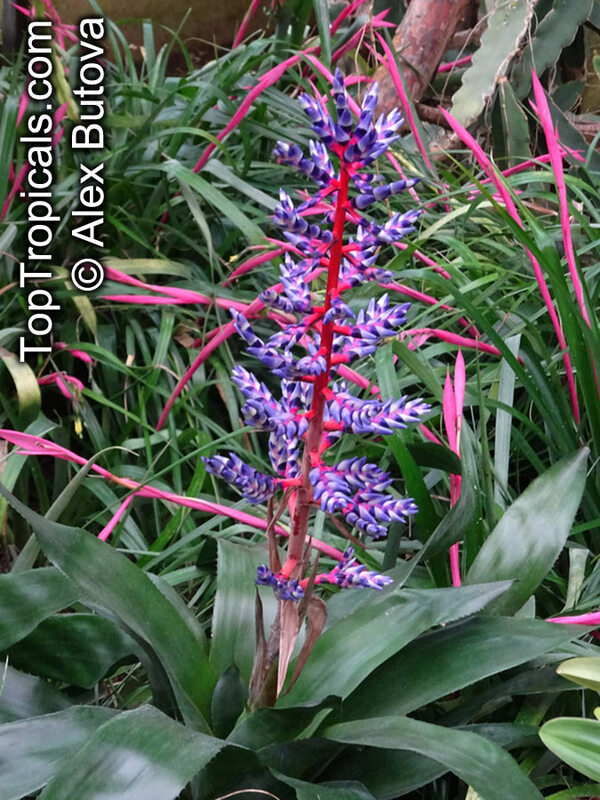 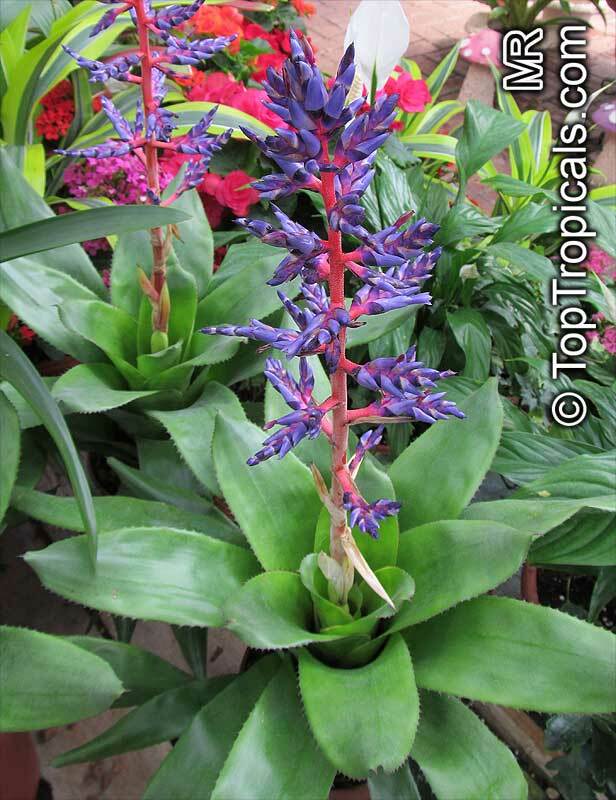 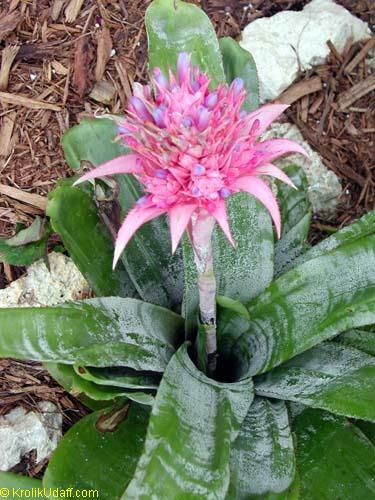 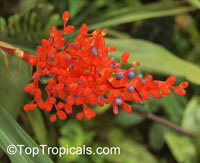 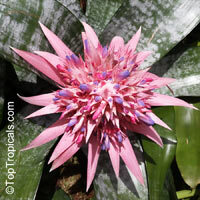 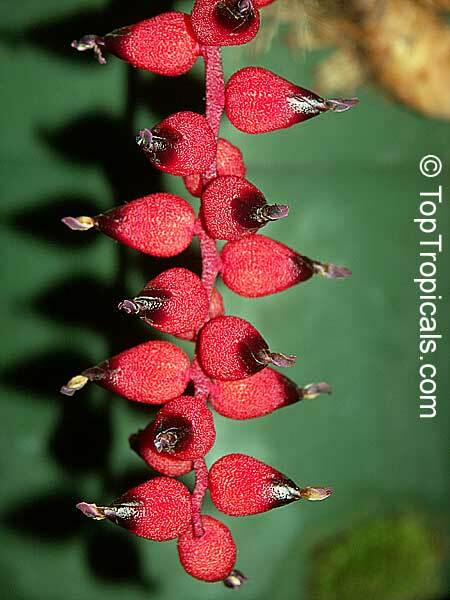 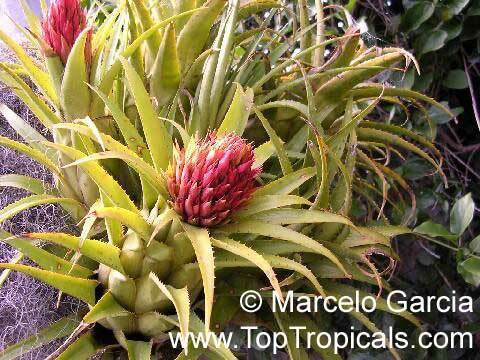 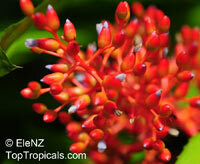 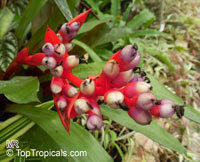 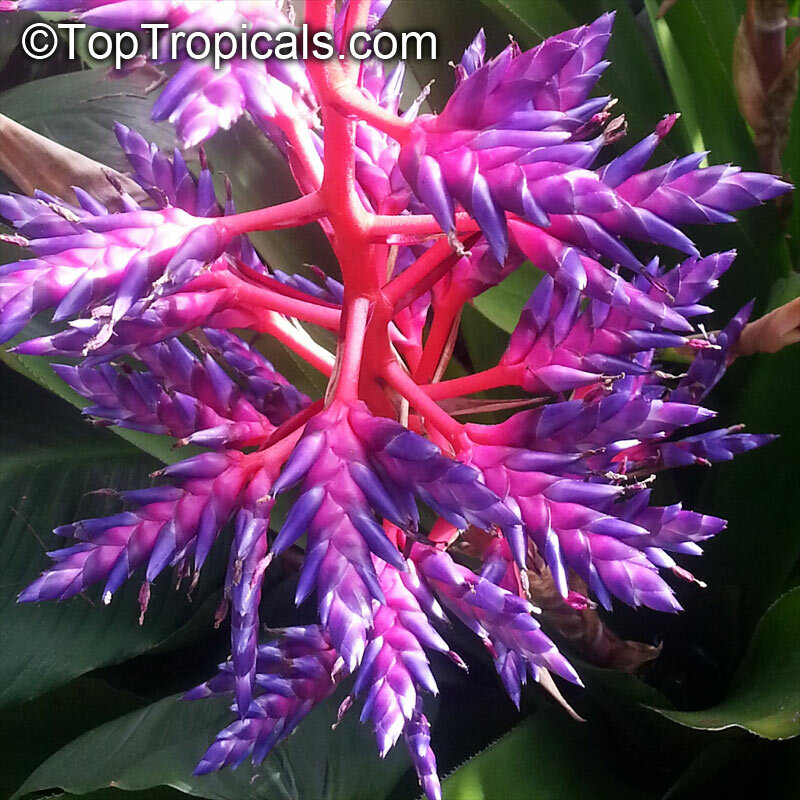 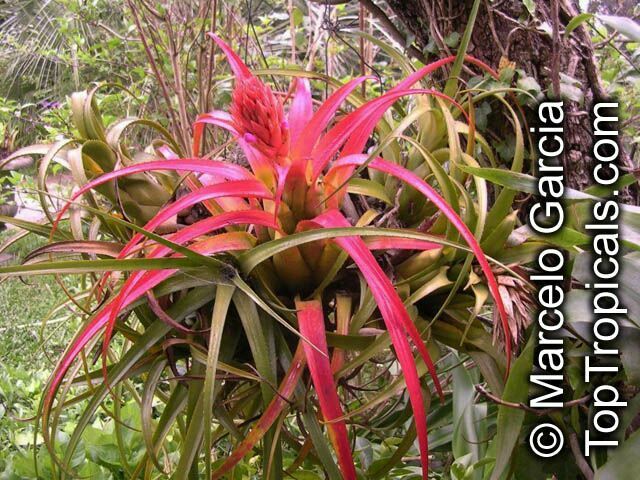 The Aechmea is very diversified, hardy, extremely popular, and very easily cultivated in the bromeliad family group. They range in sizes from a very tiny 6 inches, to more than 10 feet in height and 6 feet in diameter. 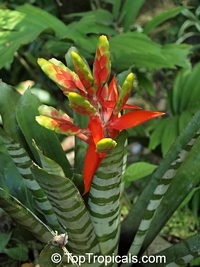 Their foliage colors vary from lime green, yellow, red, burgundy, and black, and incorporates many patterns, spots, stripes, bands, silvering, shadings, and blotches. 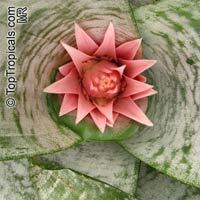 These patterns often vary form the top of the leaf to the bottom of it. 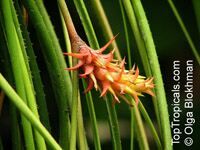 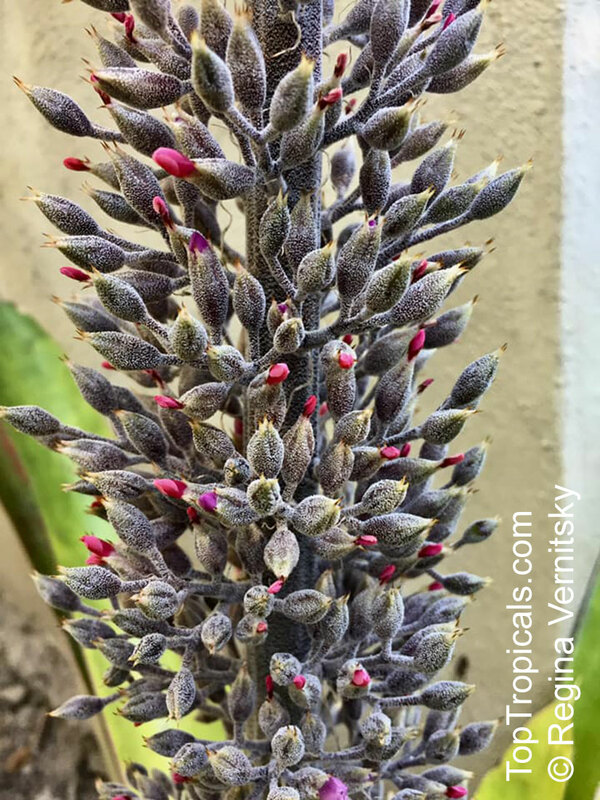 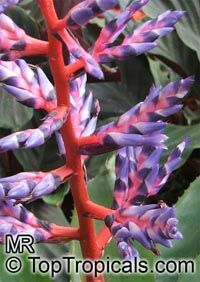 The Aechmea family has large inflorescence and brightly colored, long lasting bracts that holds the magnitude of tiny flowers. 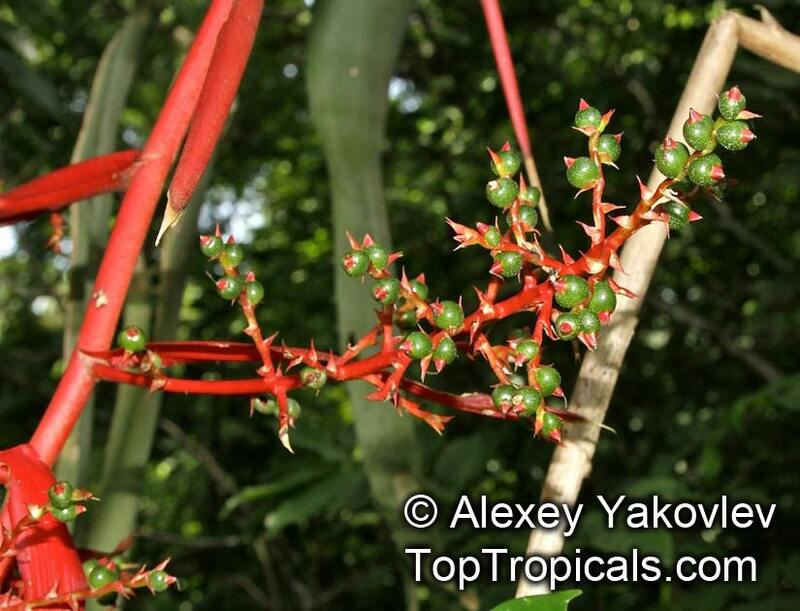 Often the colorful berry-like fruits mature for a long time on the flower spike. 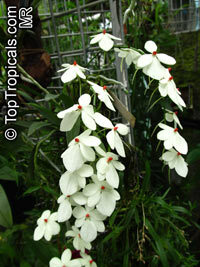 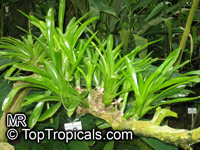 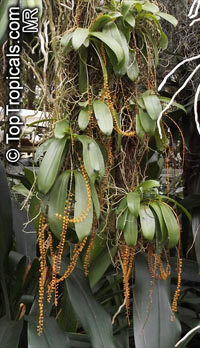 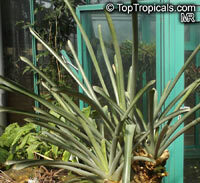 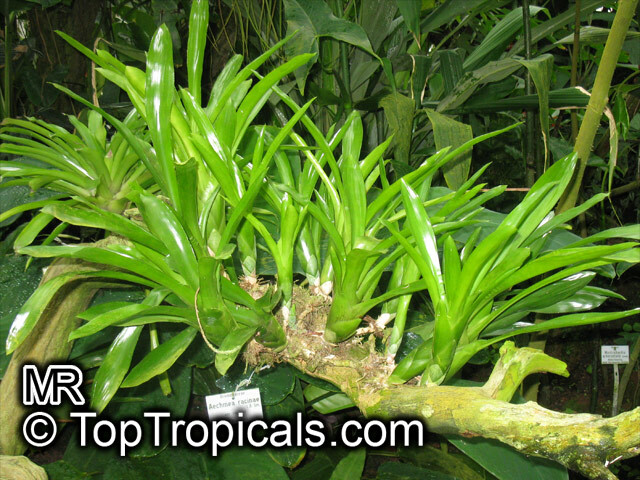 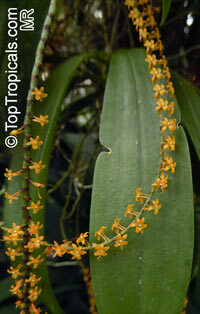 It's a very healthy, cold and rot resistant plant to grow outdoors fixed in trees, walls, or, in pots in an orchid mix. 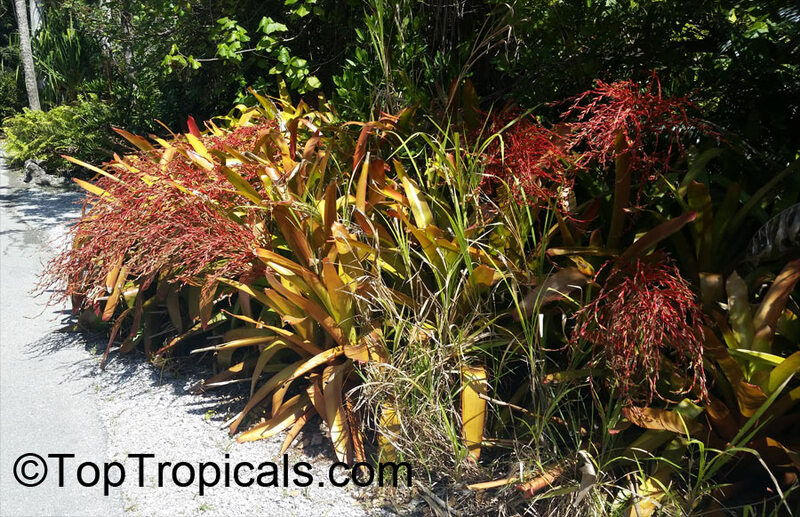 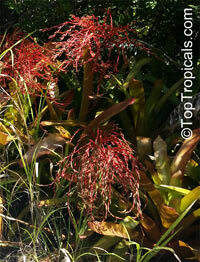 Adult plants need a sunny position to become red in the blooming period. In a luminous shade it flowers, but the leaves remain green. 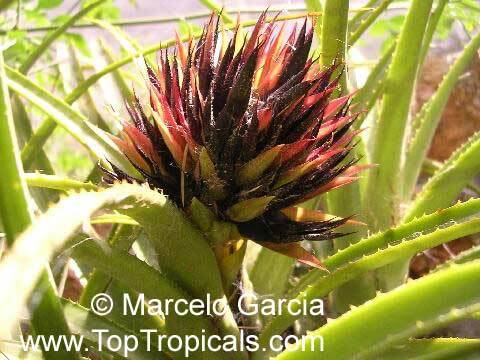 The rose bracts persist a long time, and if flowers are pollinated black pointed fruits will appear as shown in the picture. 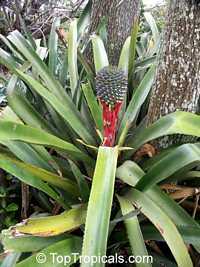 It's curious because, when the plant grows in very shaded locations the leaves become very long, to the point to seem a completely different plant and very elegant indeed, with no weak aspects. 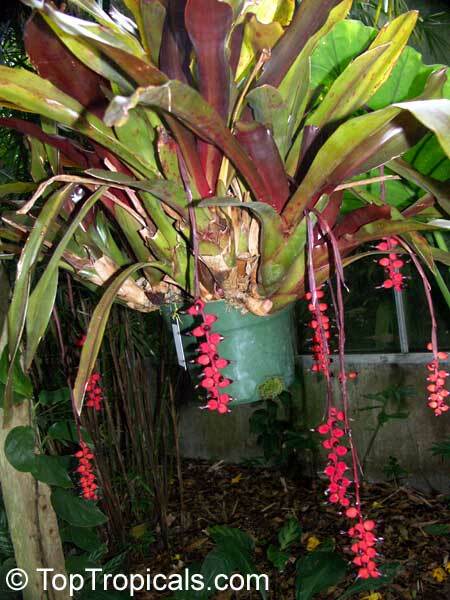 However, if it is gradually moved to full sun it blooms and the leaves become red. 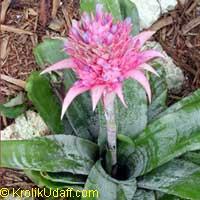 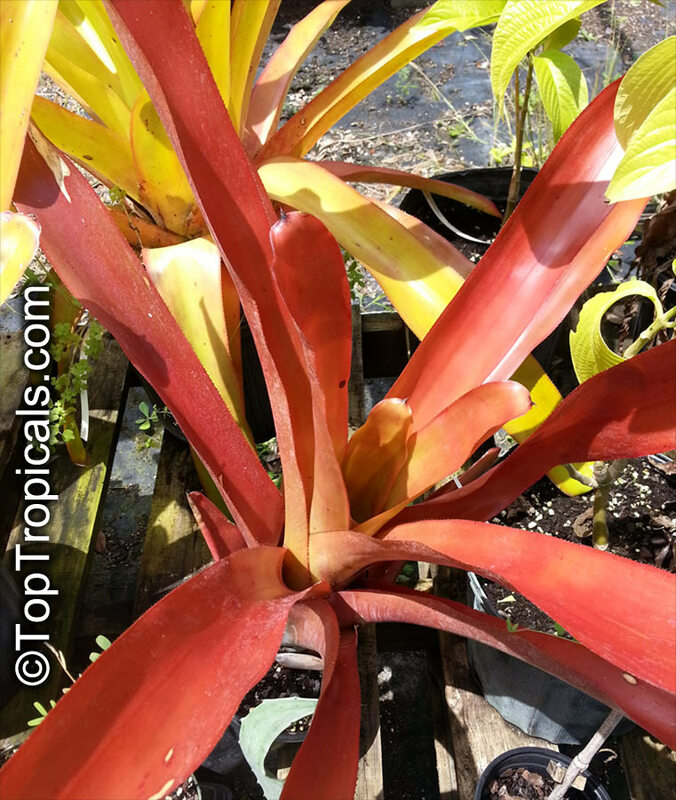 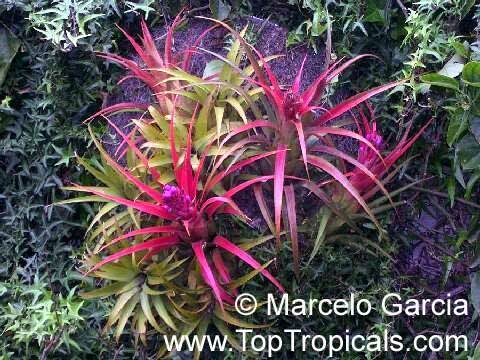 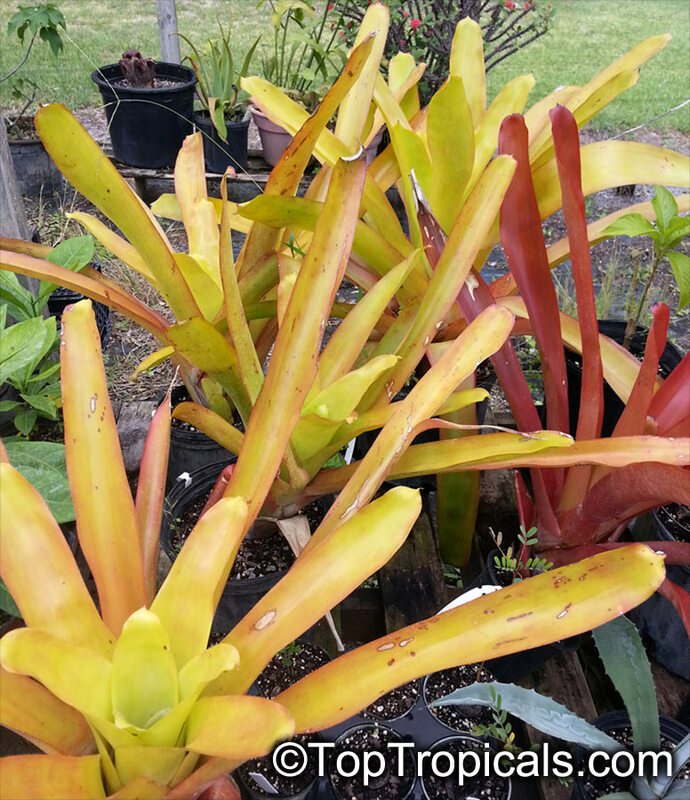 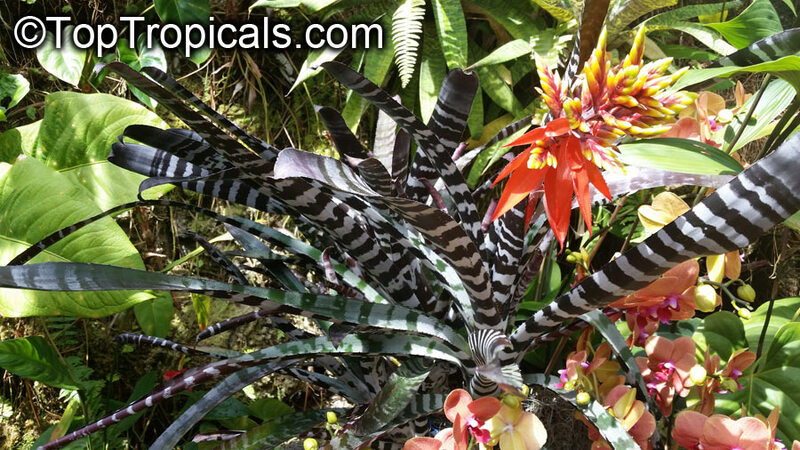 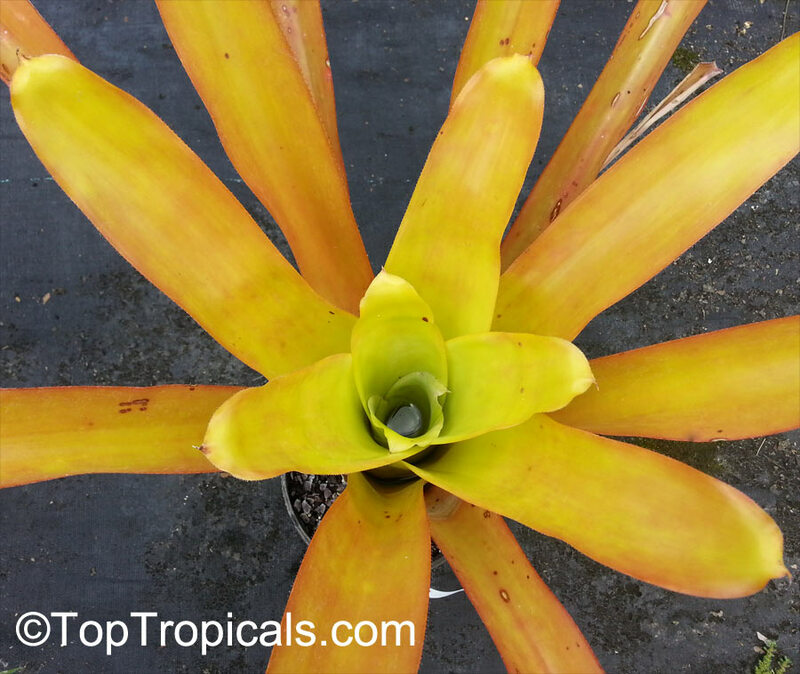 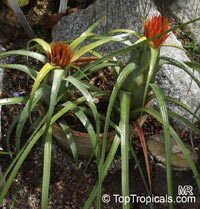 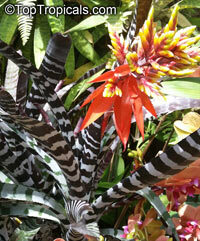 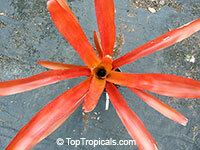 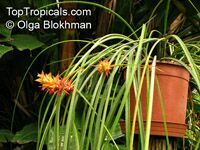 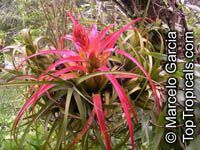 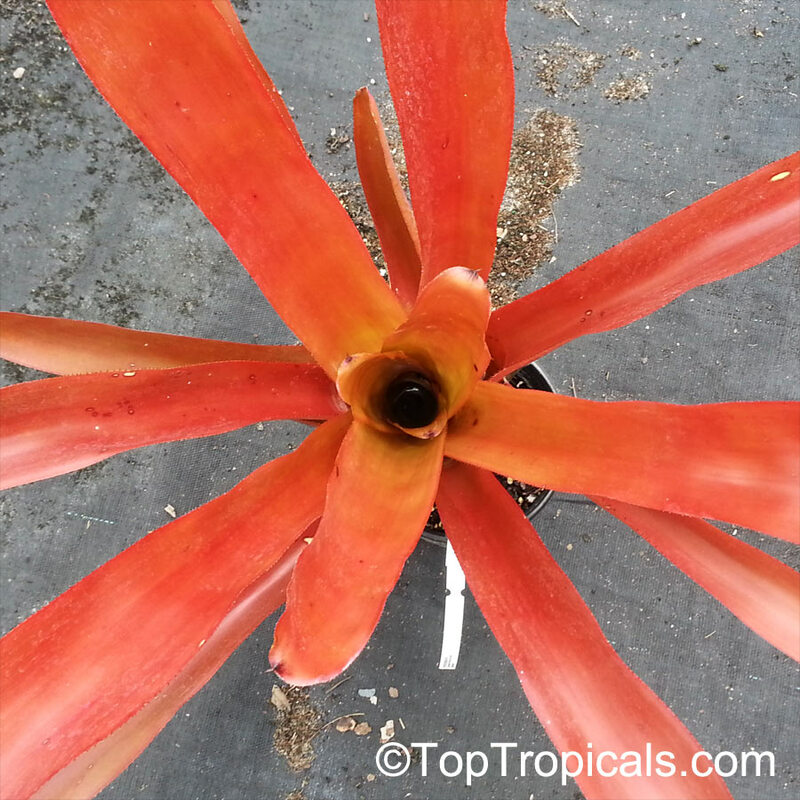 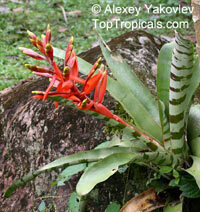 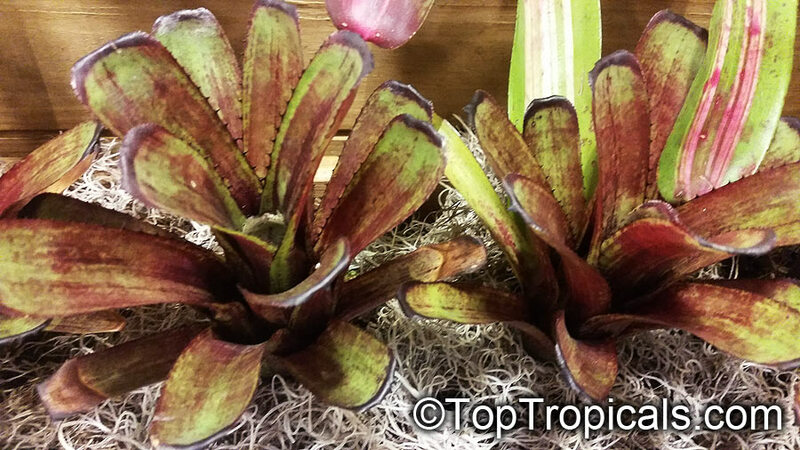 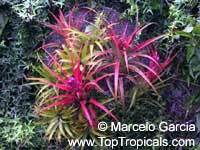 See Bromeliad page. 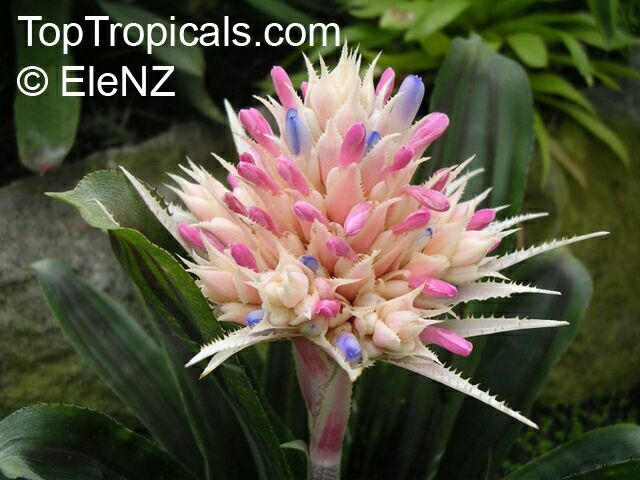 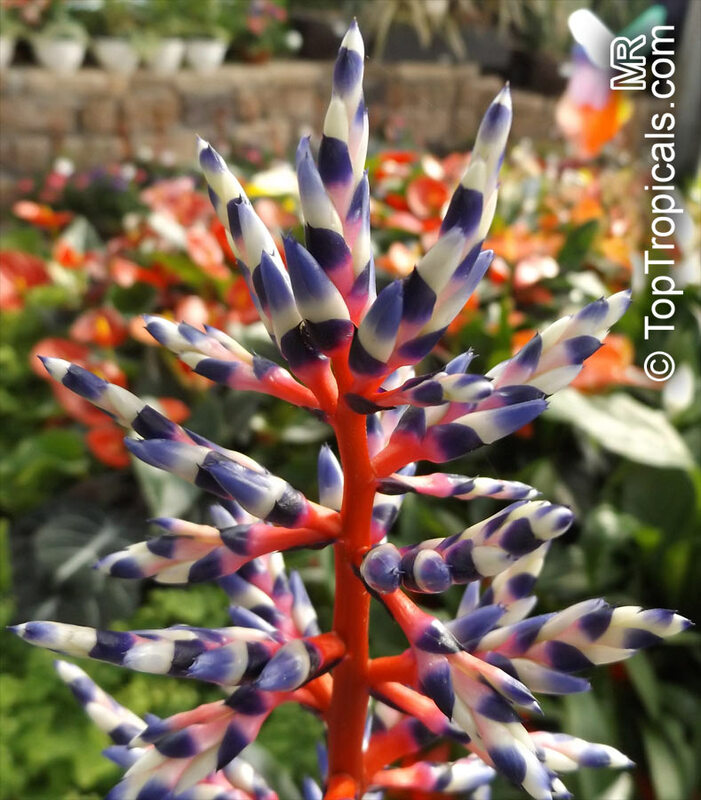 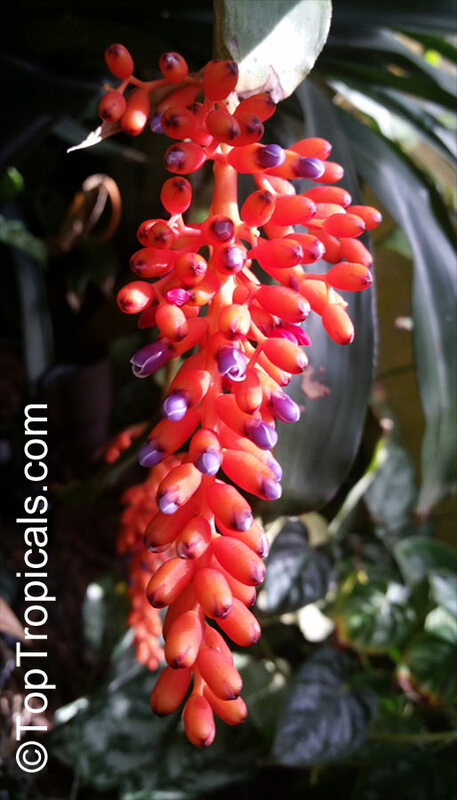 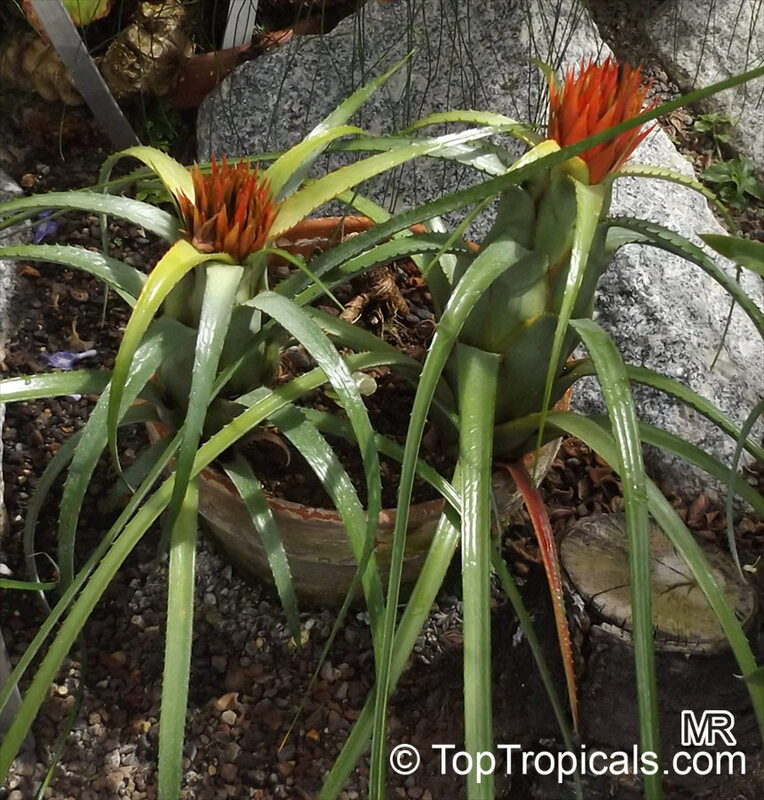 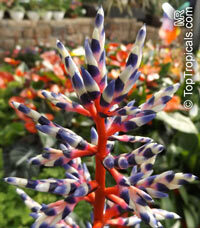 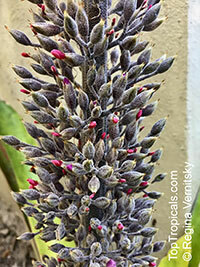 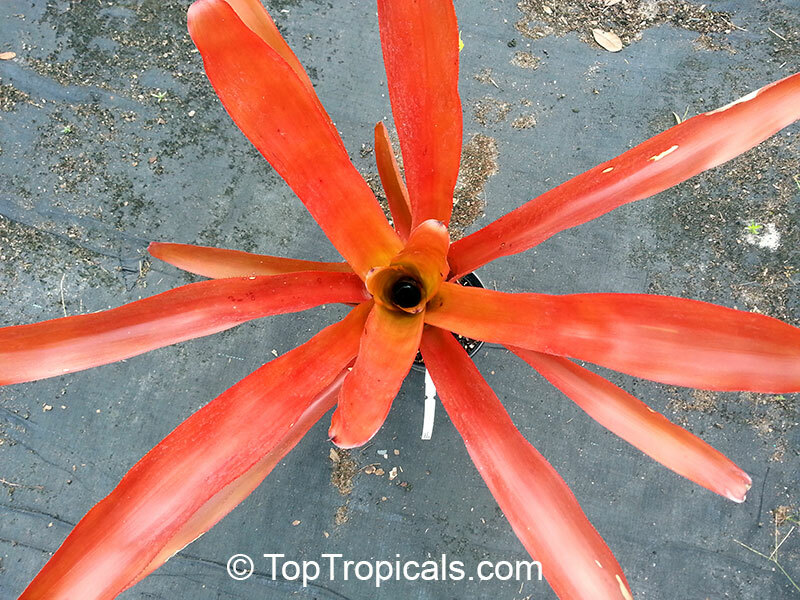 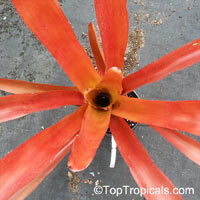 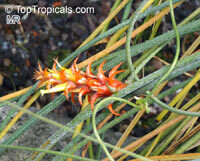 Aechmea tillandsioides is a showy exotic bromeliad native to southern Mexico, Central and northern South America. 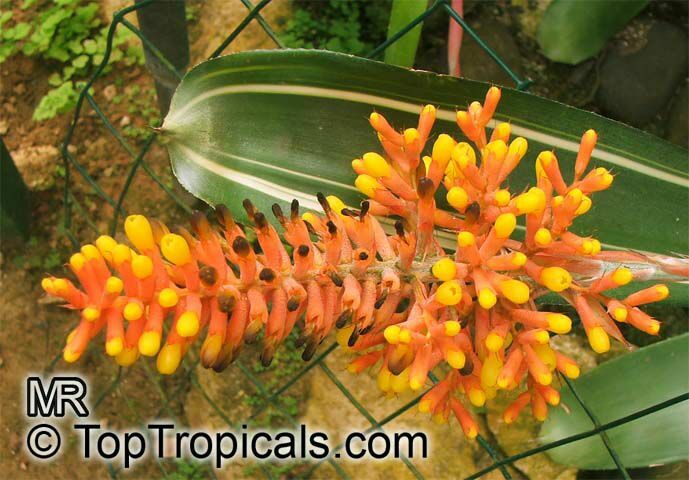 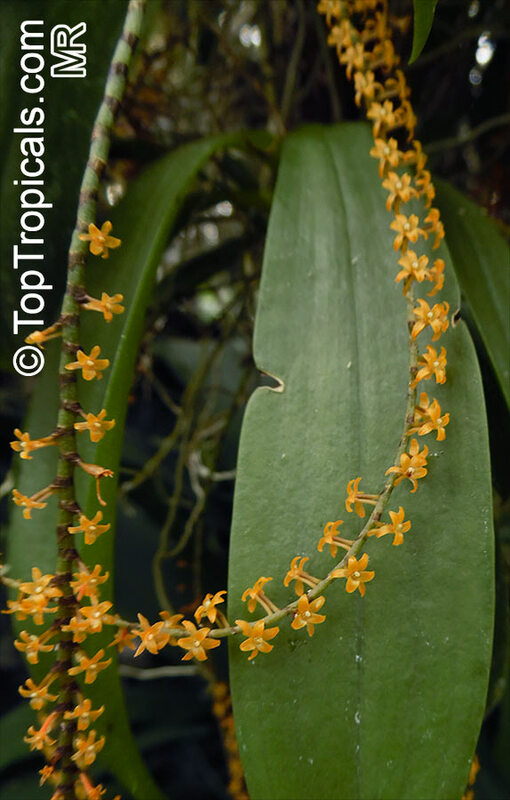 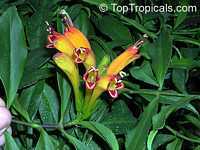 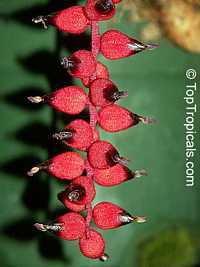 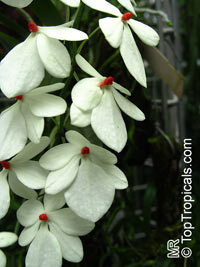 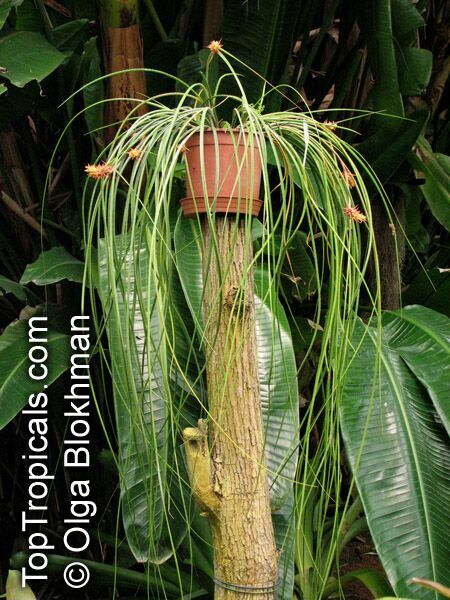 It is widely cultivated in other regions as a tropical ornamental. 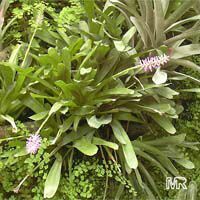 This plant is cited in Flora Brasiliensis by Carl Friedrich Philipp von Martius and is a real must for all plant enthusiasts. Aerangis hariotiana blooms in the late winter to early spring (northern hemisphere) with numerous racemes of densely packed sherbet-orange, strongly night-scented, miniature flowers. 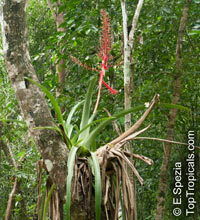 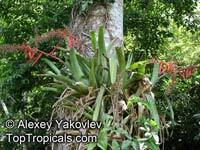 A small, usually pendulous, monopodial epiphyte that is almost stemless. The short stem is hidden by the basal sheaths of closely set leaves. 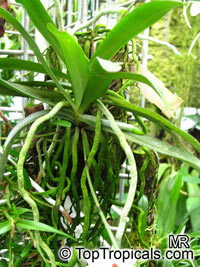 The roots are often flattened, with thin velamen, are green when wet, and have emerald green tips. 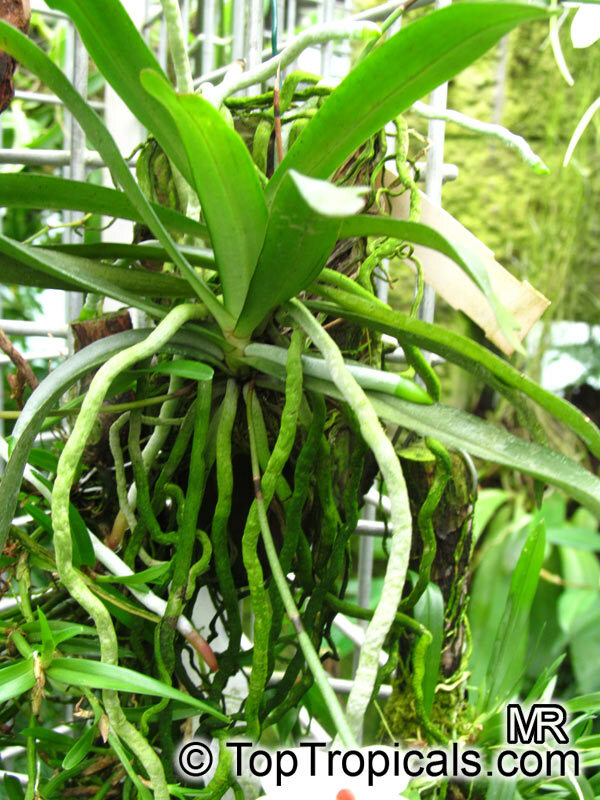 Aerangis luteo-alba var. rhodosticta has yellowish white flowers with a bright orange-red column. 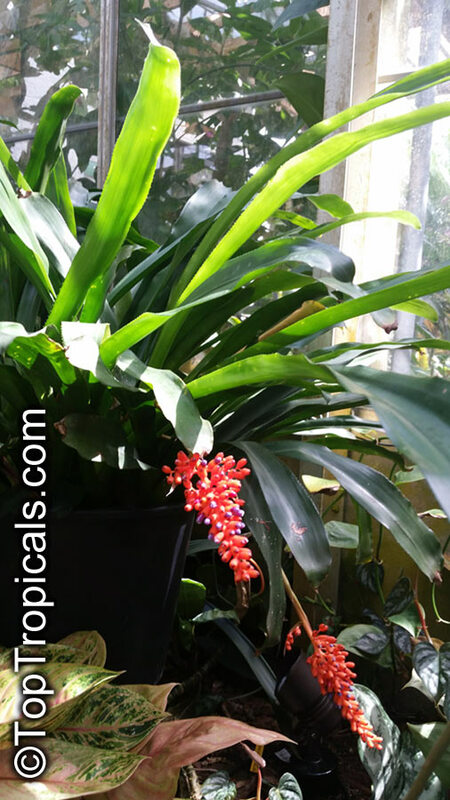 Cultivated plants should be kept moist during periods corresponding to the wet seasons. They should be allowed to dry slightly between waterings during the dry seasons, but should never dry out completely or be left dry for extended periods. 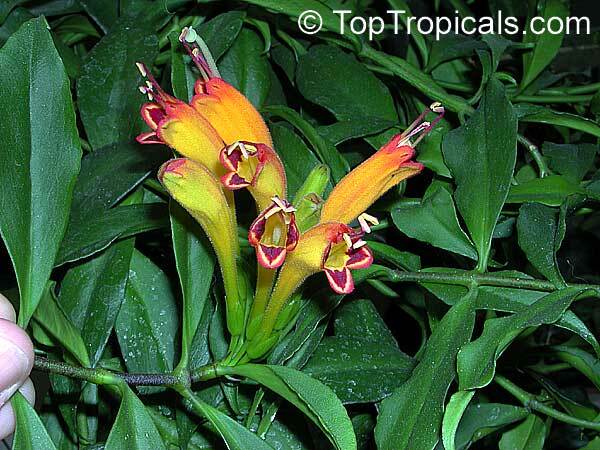 Aeschynanthus speciosus is a species of trailing ephiphytic flowering plant, in wild growing on branches of trees in the tropical rainforests. 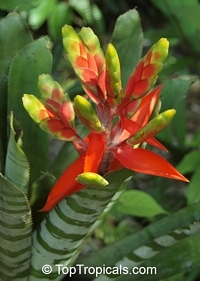 The large, fleshy, dark green leaves are up to 4 inches (10 cm) long and 1 1⁄2 inches (3.8 cm) wide and are arranged in groups along the stems.The flowers are orange with the inside of the mouth orange-yellow and with a dark red bar across the lower lobes which also have scarlet borders. 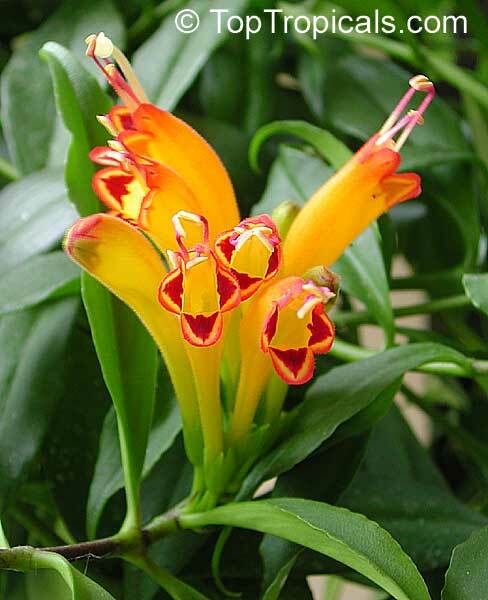 Aeschynanthus speciosus are perfect as hanging or trailing plants.These plants are perfect for a greenhouse, sunroom or conservatory. 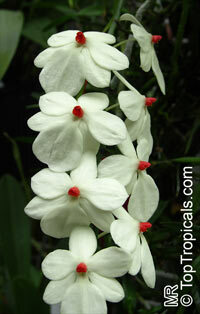 They require high humidity and warmth throughout the growing season, as well as strong, but not direct, light. 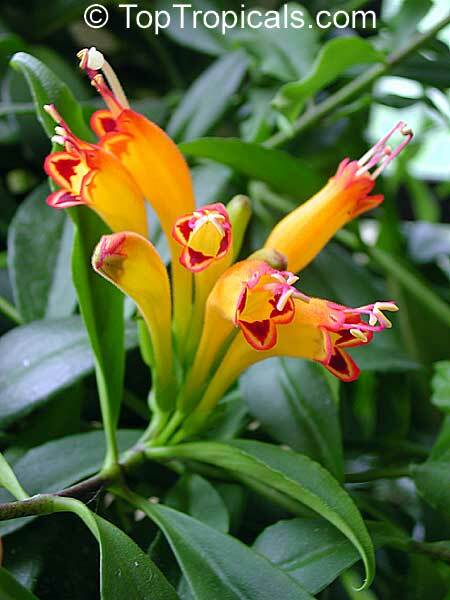 Aeschynanthus speciosus is perhaps the most spectacular species within its genus. Flowers may be 4 inch long, are orange with the inside of the mouth orange-yellow and with a dark red bar across the lower lobes which also have scarlet borders. 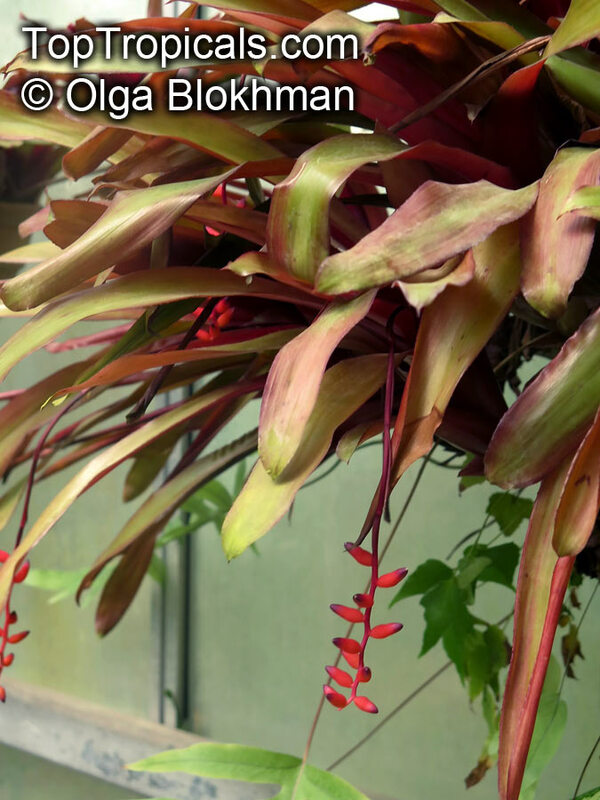 The plant is displayed to best advantage in a hanging basket, where the broad surface area allows the trailing stems to root down at intervals and send out abundant side-shoots, perfect as hanging or trailing plant. These plants require high humidity and warmth throughout the growing season, as well as strong, but not direct, light. These plants are perfect for a greenhouse, sunroom or conservatory. 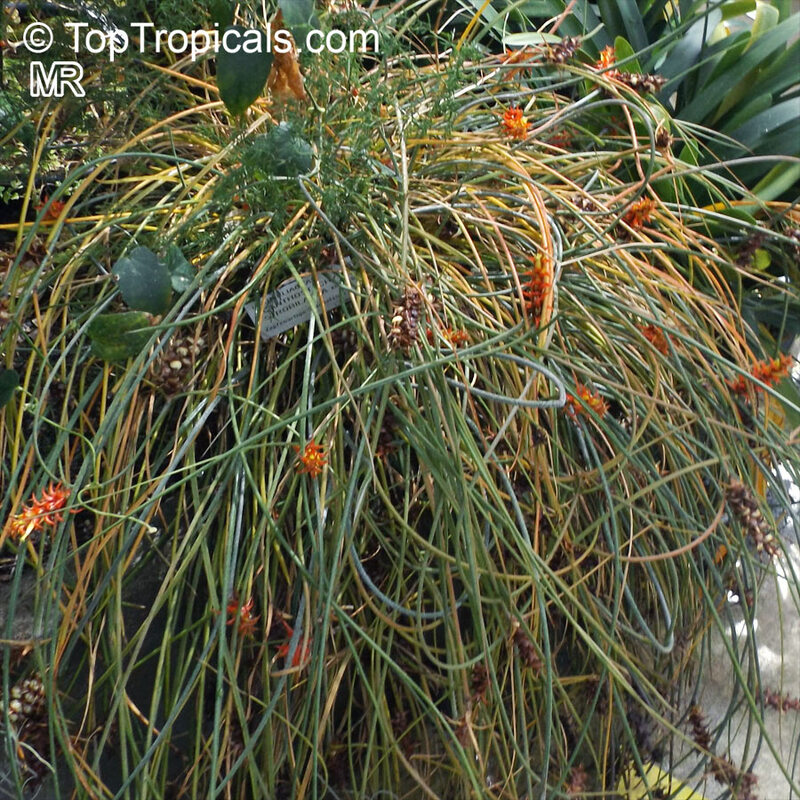 Perfect for hanging baskets/pots to best display their lovely cascading stems and attractive flowers or in containers placed on a pedestal or windowsill. 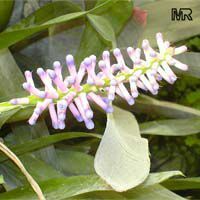 The plant can be kept in a bathroom window sill or kitchen for increased humidity.